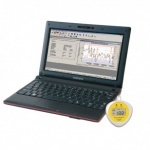 his data logger cradle or dock is supplied complete with ThermaData Studio PC software and a start magnet. 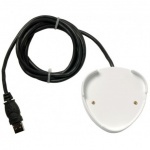 Each USB cradle is supplied with a one metre PVC lead. The ThermaData Studio Software has the ability to display up to 32 traces on a graph, the trace colours are user selectable. All files can be viewed as thumbnail icons for easy identification. The software allows the user to programme the logging sample/interval rate (0.1 to 255 minutes), the real-time clock, °C or °F, delayed start (maximum 23 hours, 59 minutes) or select a manual start option. It is also possible to include a 32-charater user ID for each logger. By selecting continuous logging in the software options, it is possible to start the ThermaData Logger only once and never have to reset its parameters again, even if downloaded regularly. Unlike many loggers, the ThermaData Loggers will continue recording during and after downloading the data.